When James Bond is in New York City as Peter Franks (but traveling as James Bond, if that makes sense) in Diamonds Are Forever, he is booked into the Astor Hotel by the diamond smuggling organization he is working for. Because of that, unlike in Live and Let Die at the St Regis, Bond does not get the top suite in the hotel, just a standard room. He spends most of a weekend there, including most of the day on Saturday when he sat in his air-conditioned room, avoiding the heat and composing his report. Tiffany Case is also staying at the Astor, and as Bond leaves her at her door Friday night, she suddenly kisses him and then pushes him away. 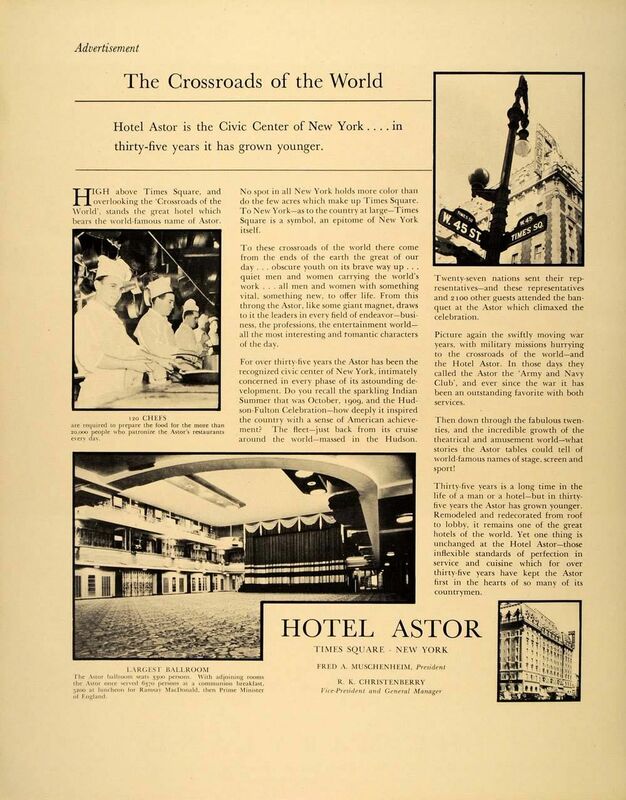 In the short story 007 in New York, Bond also stays at the Astor. The Astor. 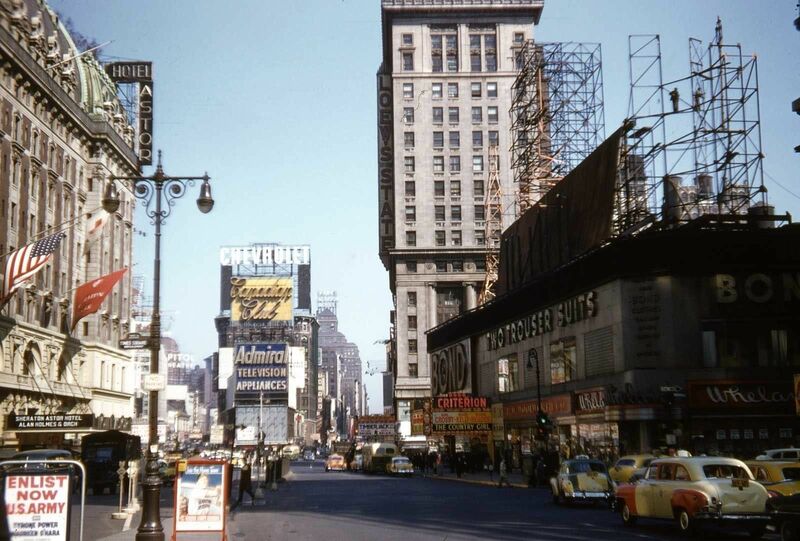 It was as good as another, and Bond liked the Times Square jungle – the hideous souvenir shops, the sharp clothiers, the giant feedomats, the hypnotic neon signs, one of which said BOND in letters a mile high. Here was the guts of New York, the living entrails. 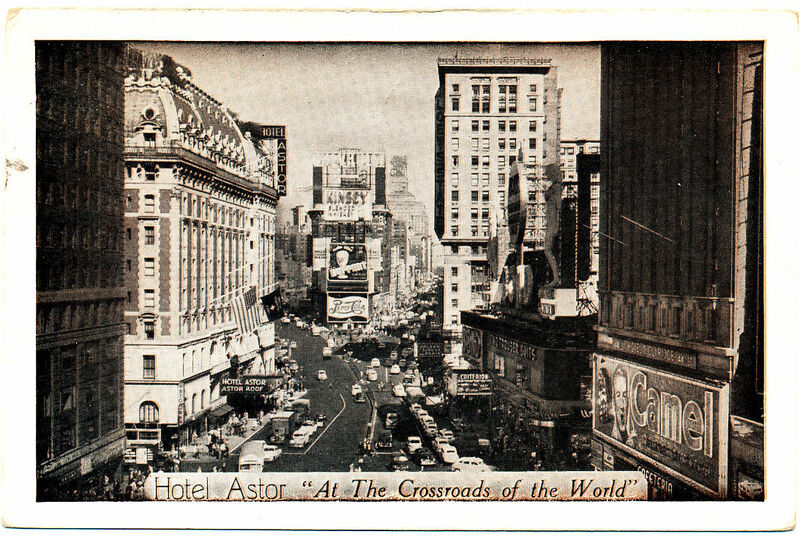 The Astor was located in what is now Times Square in Manhattan. Built in 1904, it played a large role in making Times Square the center of New York. 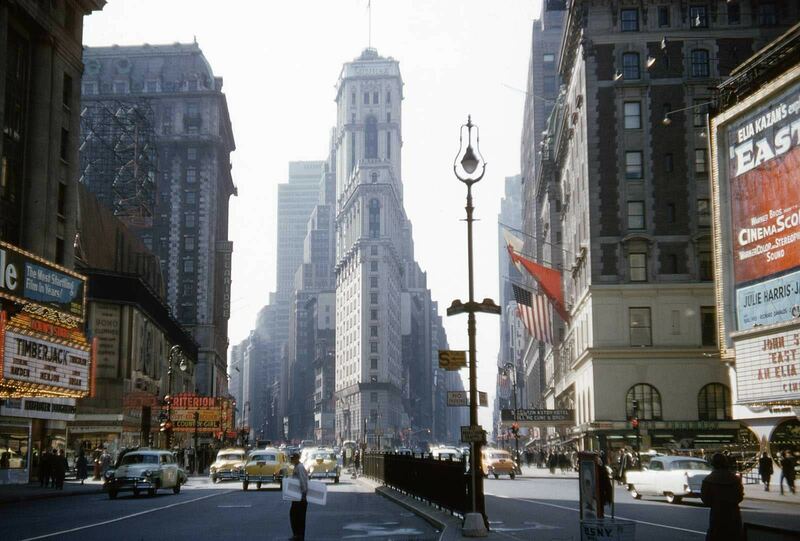 The hotel operated until 1967 , it was destroyed in 1968 and replaced with a 54 story office building – One Astor Plaza. Astor on the right, in the year the Diamonds Are Forever was written. Across the street you can see the BOND sign mentioned in 007 In New York. 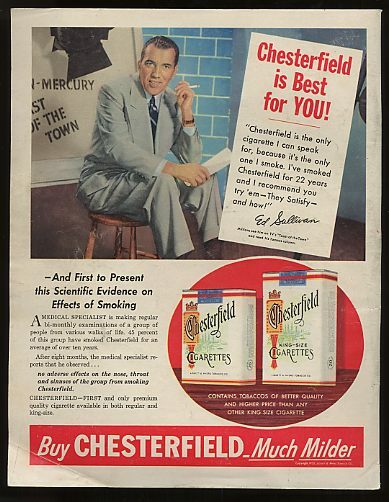 Same year, Astor on the left this time. The BOND sign is on the right. Undated. You can see the BOND sign on the right in this one, too. 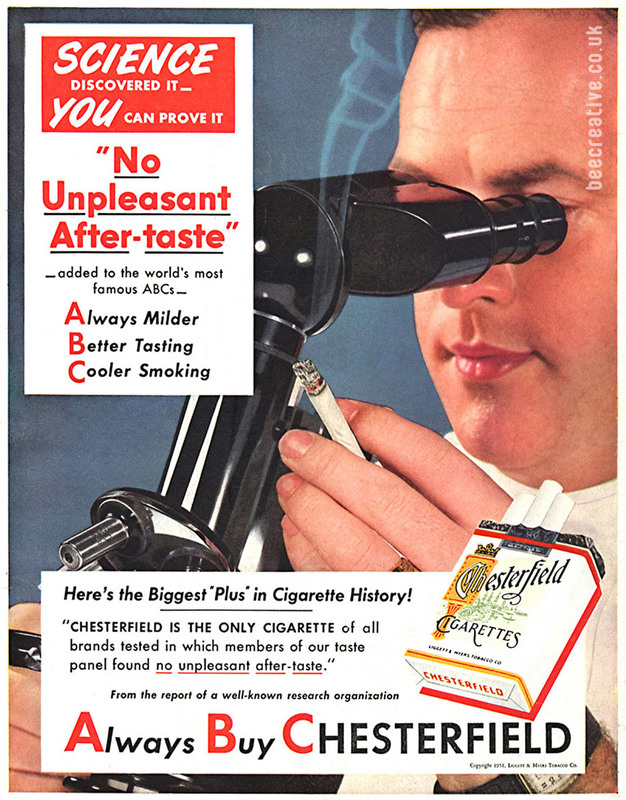 But the scrambled eggs and sausages and hot buttered rye toast and the Millers Highlife beer came quickly and were good, and so was the iced coffee that followed it, and with their second glass they got away from’shop’ and their private lives and got on to Saratoga. In the short story 007 In New York, James Bond is pondering his midday dining options. And what about the best meal in New York – oyster stew with cream, crackers and Miller High Life at the Oyster Bar at Grand Central? High Life is Miller Brewing’s oldest brand, dating back to 1903. Because of its high carbonation level, it is known as “The Champagne of Beers” this is perhaps why Fleming included in the the story. It comes in distinctive high-necked glass bottles to go with the champagne image. Miller High Life was considered a high-end beer for many years in the United States. Now, not so much. Because of the carbonation, it’s a decent drink on a hot summer day (like drinking an alcoholic soda) but isn’t good for much else. In the New York portion of Live and Let Die, James Bond spends his nights at the St Regis, a hotel built by John Jacob Astor IV as a companion to the Waldorf-Astoria. The hotel opened in 1904. 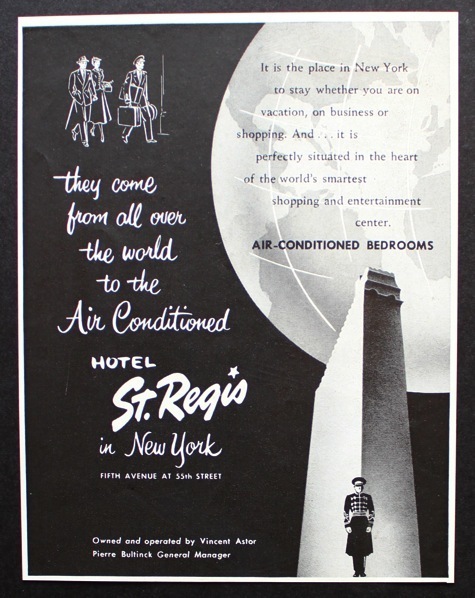 They drew up at the best hotel in New York, the St Regis, at the corner of Fifth Avenue and 55th Street. Dexter unlocked the door of No. 2100 and shut it behind them. They were in a small lighted lobby. They left their hats and coats on a chair and Dexter opened the door in front of them and held it for Bond to go through. 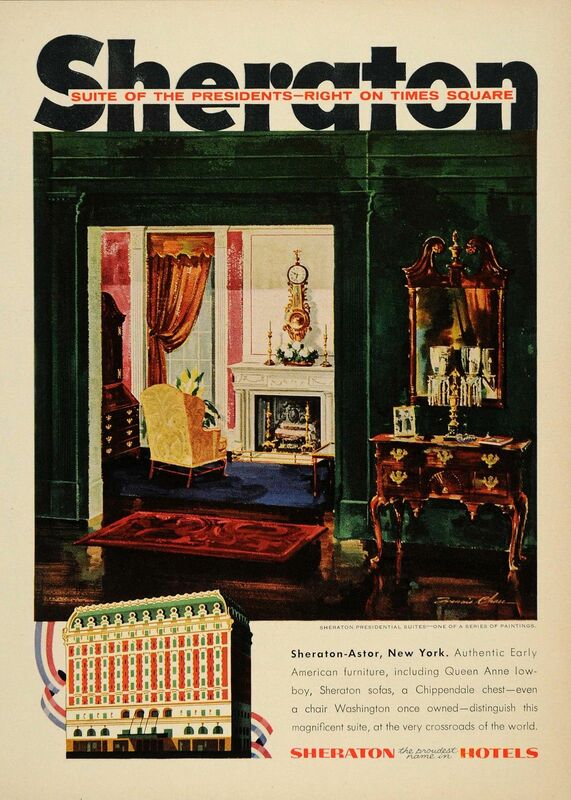 He walked into an attractive sitting-room decorated in Third Avenue ‘Empire’ – comfortable chairs and a broad sofa in pale yellow silk, a fair copy of an Aubusson on the floor, pale grey walls and ceiling, a bow-fronted French sideboard with bottles and glasses and a plated ice-bucket, a wide window through which the winter sun poured out of a Swiss-clear sky. The central heating was just bearable. The communicating door with the bedroom opened. As noted by John Griswold, the St Regis only has 20 floors. 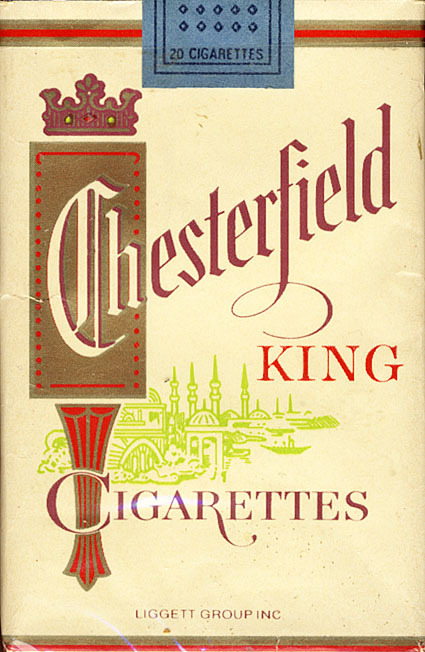 (So his room should’ve been 2000) He notes that Fleming meant to place Bond on the top floor of the hotel, and the confusion may have arisen in the different between the British and American methods of floor counting. The second story is considered to be the first floor for buildings in England. Bond is then reunited with Felix Leiter. 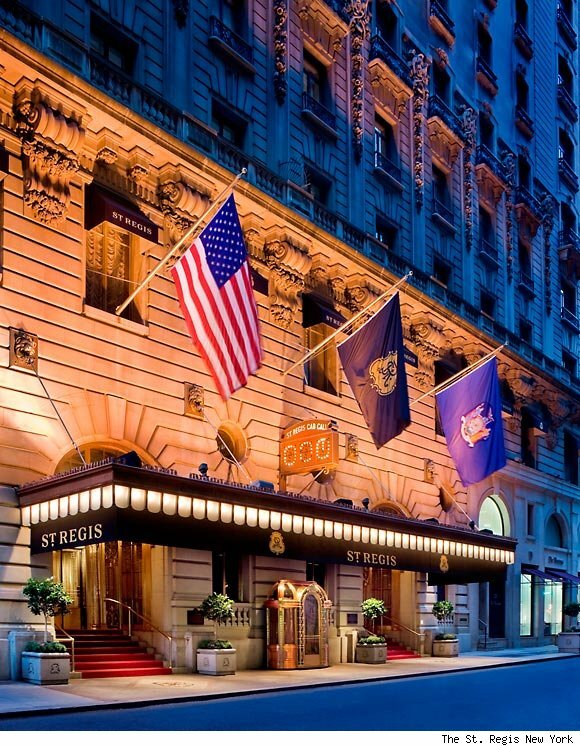 In the short story 007 In New York, (1963) the St Regis casually mentioned – As for the hotels, they too had gone – the Ritz Carlton, the St Regis that had died with Michael Arlen. 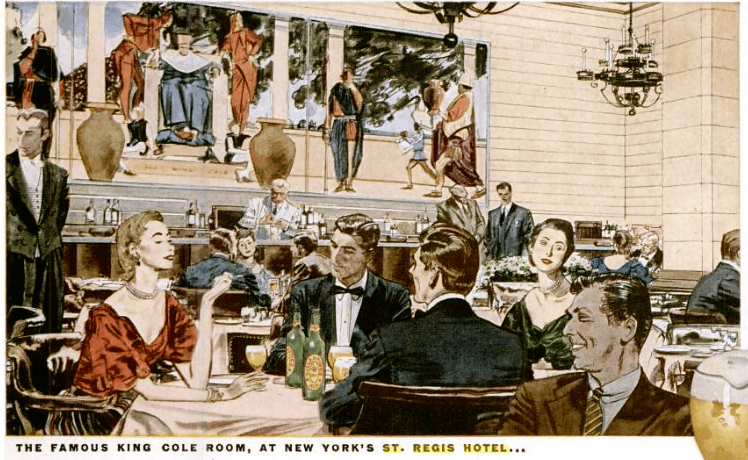 Arlen was practically a full-time resident of the St Regis, and had died in 1956. 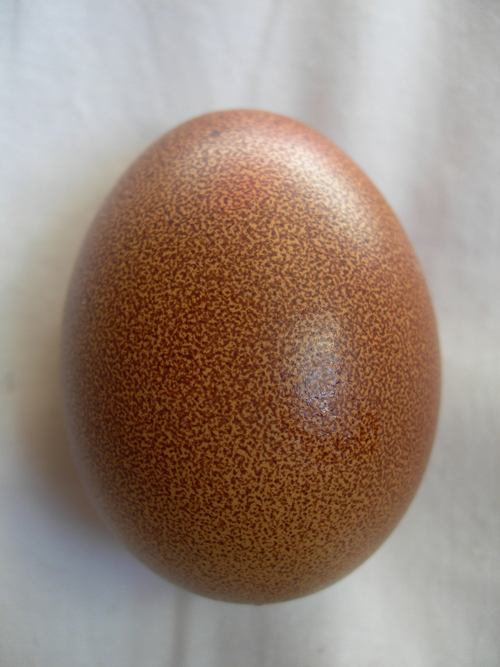 It appears that to Fleming, a large part of the St Regis died with him.